I have an OptiPlex 990 running Windows 7 Pro 64-bit. I've added a Radeon HD5450 graphics card so I can run dual monitors. I have one monitor plugged into the native VGA port and one into the new DVI port on the Radeon card. It works fine with the "extend" option, but I do not receive the "Duplicate these displays" option. What am I missing on this? Thank you!!!! 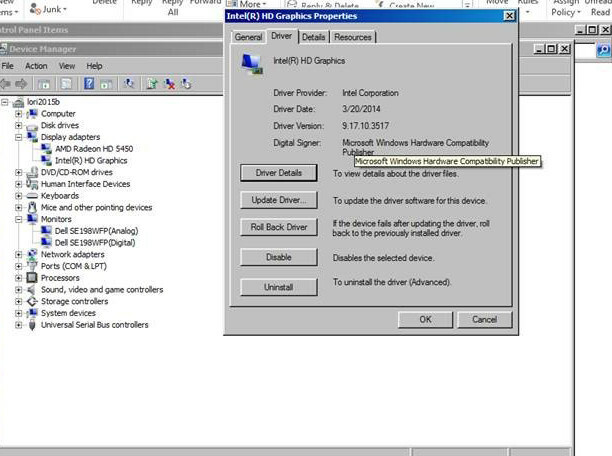 You cannot duplicate/clone when one monitor is connected to the Intel while the other monitor is connected to the Radeon. Both monitors must be connected to the Radeon to allow duplicate/clone and/or extend within the Radeon control panel. Thanks for the answer, Chris. I'll work on making that happen today. Chris... Do you mean that physically or via the driver? I originally assumed the latter, but rereading it, I'm now not sure. I have configured the adapter so that it is low-profile, meaning that I only have an HDMI and a DVI port on the adapter. I tried several configurations to get the VGA hardware to connect with the RADEON driver, with no success. I keep getting messages about incompatibility. Physically, both monitors must be connected to the Radeon HD5450. Thank you, Chris. That was the piece I was missing. I got a HDMI to VGA adapter and it worked like a charm.